I created this painting because all my friends are having babies and I wanted to celebrate their lives with them in my painting. They say that you don't choose your family- God chooses it for you. 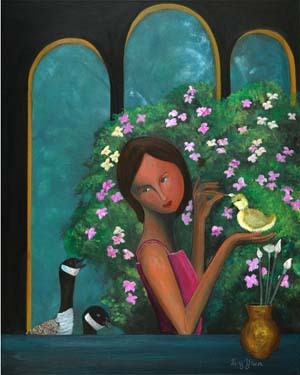 In my painting the girl is the Goddess and she is creating the duckling for the impatient parents. I am thrilled for my friends who are entering the world of parenthood and I'm sure they will be rewarded in the joy of their new babies.